Pollinators such as honey bees and native bees play a vital role in U.S. agriculture and the economy, providing more than $15 billion of value in pollination services every year. Our farmers depend on them to produce foods like fruits, nuts and vegetables. However, many species are facing an environmental and biodiversity crisis, and lack of healthy food sources and habitat is a primary cause. Time Magazine has highlighted how several hundred bee species could be wiped out if we don’t take urgent action to save them. Nobody—especially farmers—wants to see populations of these species at such risk that they become listed for protection under the Endangered Species Act. Globally, bees are responsible for fertilizing more than 90% of the planet's 107 major food crops. Once commonplace in our backyards, the beautiful Monarch butterfly has lost nine-tenths of its population in the last 20 years. These extraordinary creatures are known for their 2000-mile migration from Mexico to Canada. Yet despite being able to complete such an amazing journey they are also under threat from loss of habitat, particularly milkweed plants, climate change and deforestation. They are vital for a healthy ecosystem, pollinating wildflowers and as a source of food for other wildlife such as birds, small animals, and other insects. This is why Eden is prioritizing the establishment of healthy pollinator habitats at all our community solar farms, something we pioneered in the UK and are now very pleased to bring to the US. We’re working closely with local farmers to maximize the agricultural benefits we can bring alongside clean energy. Learn more about how this works in practice in this podcast with Rob Davis, Director of the Center for Pollinators in Energy. The good news is that New York’s lawmakers also now recognize the benefits of pollinator-friendly solar farms. 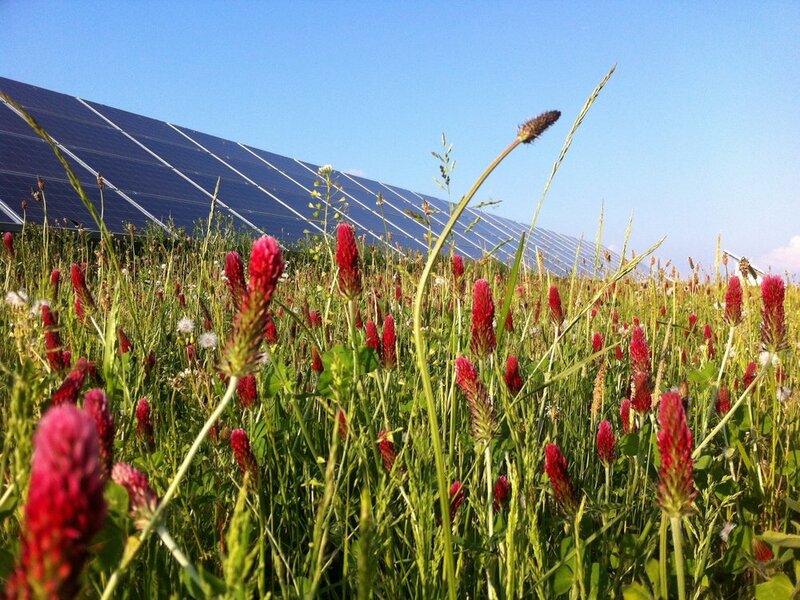 They have established a clear path forward for sowing wildflowers and native grasses under and around solar arrays. We can’t wait to get started! Most have been sown with a mixture of native wildflowers and grasses covering around 25 acres at each site, with more planned. The land is mainly managed with sheep grazing during the winter. Since the projects were completed in 2015/16, we’ve carried out annual ecological surveys which consistently show a greater abundance of wild flowers and grasses, resulting in increased numbers and varieties of species of bumblebees and breeding birds at most sites. As you would expect, results vary according to geography. At one solar farm in South Devon, we have been delighted to observe a 40-fold increase in butterflies and two sightings of a rare endangered bird species, the Cirl Bunting, which is only found in a very small area in the UK.